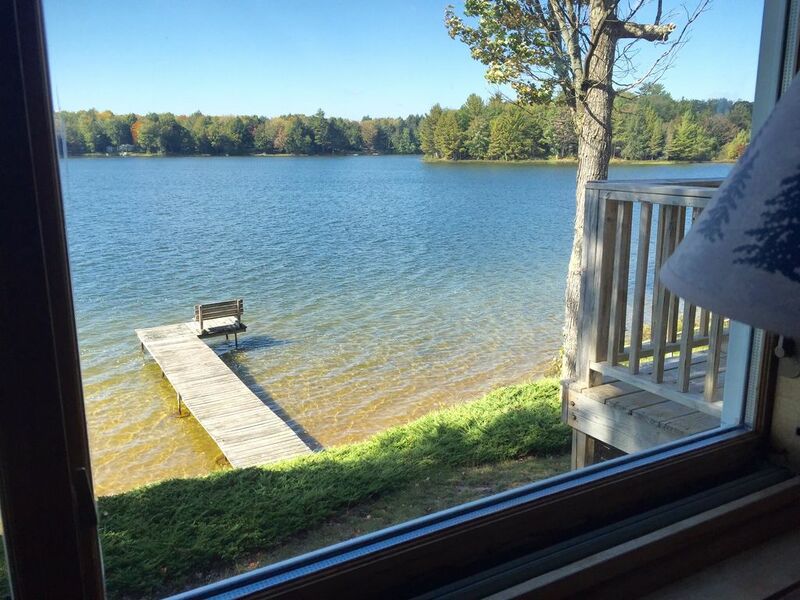 2 Bedroom, 1 Bath On 300 Feet Of Private Lake Frontage, With Fire Pit And Sauna! 2 bedroom 1 bath on 300 feet of private lake frontage. Log burning fireplace, on site laundry. Large living room with open concept to kitchen and dining. Enjoy the lake view from the separate sun porch that leads to a large deck with gas grill. Outside find a fire pit that includes wood for roasting s'mores, hot dogs and family cheer. Follow the path to the wood burning authentic Finnish Sauna. Kayaks, canoe, paddle boat and boat and motor are available for your use as well. I am from the Upper Peninsula and met my husband Pat here at 16 Mile Lake. His parents own a cottage just down the road from our Hide-A-Way and we own our own home right next door to them. We recently purchased the DQ in Munising and a small gift shop (Fireflies Gifts). We are happy to call the U.P. home! The U.P. brings much joy to our lives and we hope to share that joy with others. We hope you enjoy yourselves at our Peninsula Point Hide-A-Way! Enjoy the authentic Finnish Sauna! Sit right next to the water and enjoy a bonfire while watching the sun go down. 300 feet of private lake frontage! Swim, kayak, boat, canoe or fish, we have great Bass and Pike fishing. Come and experience our many miles of Side by Side/fourwheeler roads and trails. We are within a short distance of Pictured Rock National Lakeshore, waterfalls, pristine beaches, golf and restaurants! One of our favorites is the Buckhorn Resort just 6 short miles away. We love the UP and hope you will too! Relaxing, private property with fire pit right next to the water. Authentic wood burning Finnish Sauna! Nice place to hang out. Very quiet and enjoyed the deck! We had a great time! We highly recommend! Very quiet and peaceful place. We will stay there again! Thank you! Happy to have you folks as our guests! Loved the cabin. Knotty pine overload in a good way. Made me nostalgic for childhood vacations in Michigan cabins. Plenty of kitchen equipment, nice deck, barbecue, laundry. Great perk that the old charm was kept but the faucets, sinks, plumbing, heating system etc have been replaced. It all worked well. Comes with water toys, fire pit, wood fired authentic sauna, original painstakingly refinished wood floors. Very quiet location-- hardly saw even a boat go by. Enjoyed seeing and hearing the Flicka that lives in the dead tree by the lake. Took a spin around the lake in the fishing boat. Couldn't kayak because of injury, otherwise we'd have enjoyed those too. The surrounding parks for hiking were amazing. Sunset boat tour of Pictured Rocks was lovely after having hiked the entire cliff edge during the previous days. This time of year falls between black flies and stable flies seasons, so appreciated seeing neither, having experienced both during previous trips. Host was attentive and even left us some gifts with UP imagery as free souvenirs. Would love to come back and stay a month! Thank you Lisa and Pat for an enjoyable stay at your cabin on the lake. Thank you so much for the wonderful review! It was nice to meet you folks and we certainly hope to see you again! Enjoyed a stay of more than a week. I can now vouch for comments I'd read indicating how nice this property is and how very responsive the owners/hosts. I've been to other properties where 'everything' was provided (except food). But, here it is actually true to nearly the smallest detail. Thank you Brian for the wonderful review. We hope to see you again next year. Have a wonderful winter. 15 miles to the famous Pictured Rocks National Lakeshore! Canoe/Kayak the Au Train River - Rentals available at Northwoods Resort in Au Train, MI. Enjoy one of our many pristine beaches on Lake Superior! Drive the now famous H58 to Grand Marais!